This is klingspor's retail web site. An excellent place to buy abrasives. Charles Neil is a friend of WW4B and has some great instructional materials as well as a great blotch preventer. CLICK RULE & METRIC CLICK RULE The Click Rule and Metric Click Rule are tactile and auditory measuring devices designed for individuals who are blind or have low vision. 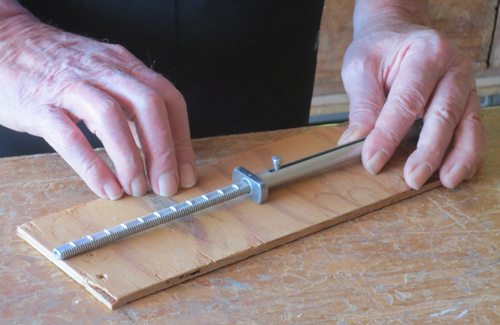 They allow for quick measurements of wood and tool setups as well as for general use The Click Rule measures up to 12 inches and is accurate to 1/16 of an inch. It measures outside and inside dimensions as well as depths of holes 3/8 inches in diameter and larger. The Metric Click Rule measures up to 20 millimeters with accurate measurements of one millimeter. The Click rule comes with three extensions allowing measurements up to four feet, and the Metric Click Rule comes with four extensions allowing measurement up to one meter. It is made from quality material and is plated to prevent rust. OPTIONS: Additional extensions are available for either rule. Community Advocates, Inc. P.O. Box 83304 Lincoln, Nebraska 68501 United States Telephone: 402-486-3091. TT: 402-486-3091.